I had planned to head down to Yokohama today and have an explore around Chinatown there. It is the biggest Chinatown in Japan and even has a museum nearby dedicated to Ramen! I have been there once, but once is not enough! I woke up this morning not feeling too well and decided against making the trip so I am planning to head to Yokohama next week. The last 2 weeks I have only taken one day off each week as it has been one of the traditional holiday periods in Japan, which means I am busier than usual. This holiday period is called Golden Week and there are about 5 public holidays that fall at this time and Japanese people are usually able to take 7 - 10 days off. Being that it was busier at work for us, I decided to work a couple of extra days. Japanese workers technically receive 20 paid holiday days each year which can technically be taken any time. In reality, it is very rare for them to be able to take all 20 days off each year. They are also pretty much only able to take time off during 3 traditional holiday periods. The Golden Week vacation, also Obon, the traditional summer vacation in August where people usually go back to their hometowns and spend time remembering dead relatives. You can read more about it here (http://en.wikipedia.org/wiki/Bon_Festival). The third and final one is Winter holidays where a lot of Japanese companies and shops close down over the New Year period. I finished work early yesterday as I wanted to head along to a concert last night. The band that I wanted to see is called Fade. They are a Japanese rock band consisting of 4 Japanese and 1 American. The American guy (Jon) is the singer and during my first stint living in Japan (from 2000 - 2004) I lived with him. At that stage the band was just starting out in Japan, having started in New York. I kept up with how they were doing. They actually became quite successful and have had one of their songs featured on a movie soundtrack and also made the intro theme song for the TV animation "Deadman Wonderland" I bought each of their albums that were released and really enjoy their music now. So I wanted to go along to watch them for the first time in 9 years! They were playing halfway down a line-up in a small intimate concert hall in Shimokitazawa. I got there at about 8:30 and asked the lady at the ticket box what time Fade were on and she said they were on now, so I rushed into the hall, and they had just started their set. They were great and I had a huge time, I only wish more people had turned out, but at the end of the holiday period, people were probably just wanting to relax after their first day back at work. 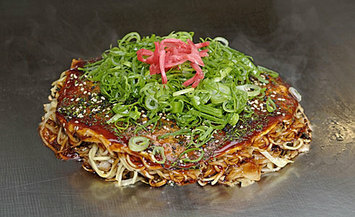 My favourite Japanese food is okonomiyaki which is like a savoury Japanese pancake. There are two varieties, one originating from Osaka and one from Hiroshima. I prefer the Hiroshima style better as it has less batter and sandwiched between a top consisting of a crepe like pancake, and an egg base is a filling of noodles, cabbage, bean sprouts, bacon, and, well anything that you like really. The word "okonomiyaki" translated into English means "any way you like it" so the choices are only limited to what the shop has for ingredients. My first experience of Hiroshima okonomiyaki came when I was living here previously and was relief teaching at a school in Shimokitazawa and one of the teachers took me to an okonomiyaki restaurant for lunch. The first mouthful was a revelation. So many delicious flavours! That restaurant quickly became my favourite and when I came back, I was looking forward to going back there for more. Unfortunately it had closed and had been replaced by a ramen soup noodles shop! I decided that one of my priorities was now to find a new favourite Hiroshima okonomiyaki restaurant. I have tried a few, but nothing comes close to my old favourite restaurant. One of my students heard about my desperate plight and took it upon himself to trawl through a Japanese language restaurant info website and found a couple within walking distance from work. The problem has been that when it is quiet during the afternoon at work for me, they are not open and they are open when I can't get there. I had tried one of the ones he suggested and while it was good, it didn't quite match up to expectations, but I will still go back there. The second one is actually a restaurant that is a sister to one in Hiroshima, so I have been looking forward to trying it. One Saturday night a couple of weeks ago I headed there after work only to find that they had a private party that had booked out the restaurant, so I wasn't able to try it. Tonight I decided to make the 45 minute trip from home to have another attempt seeing as it was a day off work for me. I got all the way there and they were closed!! It feels as though the universe is conspiring against me in my quest to find my ultimate okonomiyaki experience, but I will not be beaten! I will try again next week on one of my days off. Here is a picture of what this culinary masterpiece looks like. And here is a video of okonomiyaki being cooked in a building in Hiroshima that is dedicated to okonomiyaki! Anyway, I'll leave it there for this week. Sorry there were no explorations to write about this week, but they will return next week! I have also updated last weeks post with Hishimo's (the restaurant that I had dinner at) website. If anyone reading has any questions about Japan, or life in Japan, feel free to ask and I will do my best to answer, or some of my Japanese readers may be able to provide some insight as well. Until next week, take care, and thanks for reading. I listened to some Fade and I really like it! I love the sound of Cosmicalism and wish I could understand the lyrics... Their sound reminds me of a mixture of bands. Great guitarists too. I think So Far Gone, has a really nice intro. From the Heart has a Pearl Jam kinda sound...So yeah, thanks for pointing them out! I'm going to listen to more when I have some time. Cosmicalism is by far my favourite song of theirs. I found the lyrics in Japanese and using google translate, changd them into English and have sent them to you on facebook. Most of their albums are avaliable on iTunes which is where I used to download them from. I am doing well, and hope you are too. Hi Jason...that okonomiyaki website is a beauty..the one's I ate were not that big...they looked oishii!They are not hard to make and I reckon Aussies would enjoy them...hard to understand why no one here has given it a go.Big match tomorrow night between the cats and the dons.Surprised to see Ryder not picked..would have thought he would have replaced Gumbleton.The money is on the cats.Is there anyway you can view the match in Tokyo I wonder?Dewa mata,Noel. you are right, that okonomiyaki does look delicious!! I also agree with you that it would be a hit in Australia. I have had some of the Osaka style at a Japanese restaurant on Melbourne street in Adelaide, but it wasn't that good. I am surprised that Ryder hasn't been picked too! I will have to head over to afl.com.au and have a read about selection. Maybe Hirdy has given a reason. I don't know of any places that show to footy here. The best that I can hope for is that someone uploads a replay of the game to youtube and I can watch it from there. So far I have been able to watch the full matches versus Adelaide and Melbourne and highlights of the others. I will have my fingers crossed!